In a large bowl, whisk the apple balsamic vinegar with the olive oil, sugar and shallots until well mixed. Season with plenty of black pepper and set aside. Divide the proscuitto between the plates and scatter with the mozzarella. Toss the strawberries into the dressing, along with the rocket leaves. 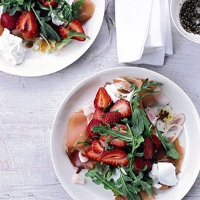 Top each plate with the dressed strawberry salad and drizzle with any remaining dressing. Season with freshly ground black pepper, then serve.